Metal detecting in Vermont follows the Antiquities Act law. Even though this law does not specifically mention "metal detecting", you need to understand what the law says about digging artifacts. People have been arrested for breaking laws that protect artifacts. This law is protecting artifacts on State or Federal lands. Private property does not comer under this law. To keep this law as simple as possible; if you are detecting in Vermont, especially on land that is not privately owned, do not dig anything that you believe is an artifact, or anything that is older than 100 years. Why 100 years? That's because then President Teddy Roosevelt wanted to protect the relics and heritage of Native American Indians living in the western states. Unfortunately, for those of us who enjoy the outdoors and the freedom it's suppose to give, Roosevelt, and others throughout the years have extended the Antiquities Law to include just about every relic under the sun. In the page I recommend you to read below you'll see that it's not just artifacts of Indian culture that is protected under this and other laws, but also something as simple as a rock. Remember, there are no metal detecting laws within the Antiquities Act. But digging 100 year old artifacts is the law. I mentioned above that individuals have been arrested for breaking the above law. This page illustrates some of the problems that have surfaced when individuals unknowingly remove artifacts on State or Federal lands. Many more stories have come to me regarding others who either knew they were breaking the law by metal detecting, or had no idea there was such a law. The archaeologists, politicians, and bureaucrats have made it difficult to search for items on any lands they control. Again, I am referring to State and Federal lands. The Antiquities Act does not have anything to do with private property. So stay off lands owned by the government, and do your metal detecting on private property. That way you won't be breaking any laws. If you're metal detecting in Vermont on private property, then be sure you get written permission from the landowner. For detecting in Vermont, town, village and city parks, you'll need to check with those local officials. 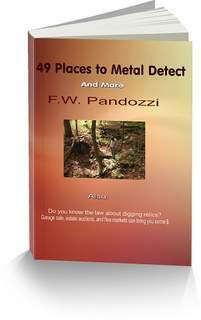 My website is all about metal detecting in eastern ghost towns and more.